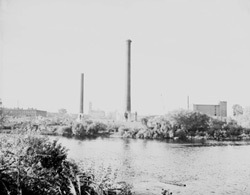 After World War I (1914-1918), the New England textile industry began to deteriorate and many of Lowell’s textile companies moved south, merged, or closed creating a severely depressed economy by 1930s. 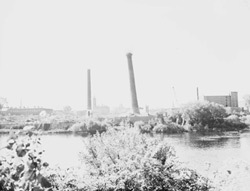 In 1936 there were only 8,000 people employed in Lowell’s textile industry (the same as in 1836 compared to 22,000 in the early 1900s). 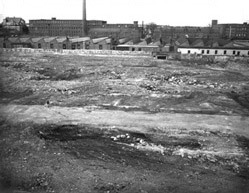 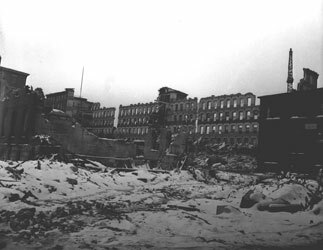 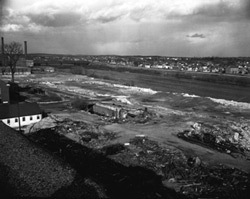 The nationwide depression in the late 1930s, forced the demolition of entire mill buildings or removal of sections to reduce the tax burden of these massive buildings. 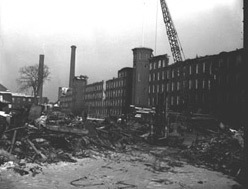 World War II (1939-1945), military contracts and awards boosted Lowell’s economy and the remaining textile companies’ dramatically increasing employment, but this boom was only temporary and in the 1950s, the Boott Cotton Mills and the Merrimack Manufacturing Company closed. 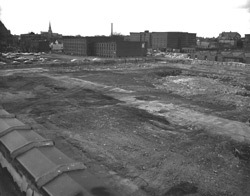 By the late 1950s, Lowell consisted of millions of square feet of empty five- and six- story brick mill buildings, a active but slowly decaying central business district, and high unemployment. 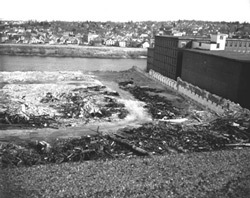 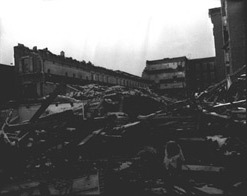 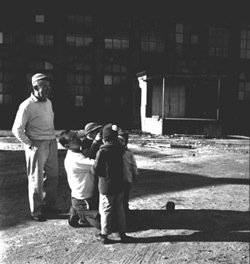 After World War II, a public effort emerged to revitalize aging and decaying inner cities known as “urban renewal.” In the 1947 Blighted Areas Redevelopment Act, the 1947 Relocation Act, and the 1953 Urban Community Conservation Act, the earliest emphasis was placed on massive demolition, slum clearance, and rehabilitation or “redevelopment.” In many urban areas the application of these efforts led to the excesses of “urban renewal” in the 1950s and '60s, with city planners arguing that the demolition of older, run-down neighborhoods improved the appearance of the city. 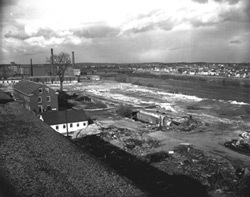 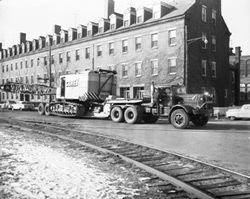 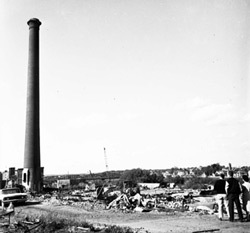 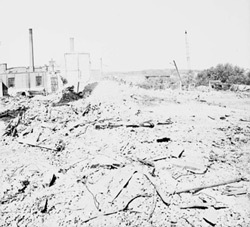 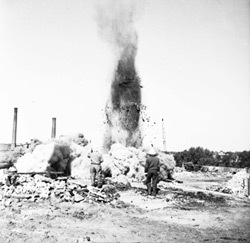 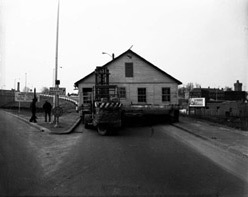 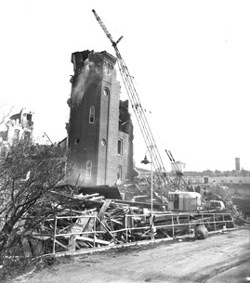 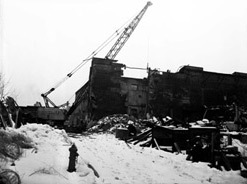 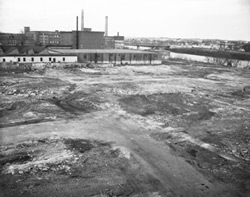 In 1960, under the umbrella of “urban renewal” the brick mill buildings, boardinghouses, and enormous chimney of the Merrimack Manufacturing Company were demolished. 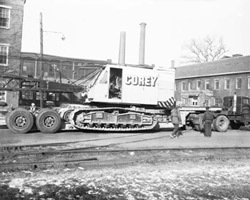 The following photographs were taken by the Corey Company and are part of the Lowell Historical Society, Lowell Museum Collection housed at the UML, Center for Lowell History.